In September, we launched Signature Bounties to encourage app development around the world using brand new tools and libraries on Blockstack. We put out a challenge to the Blockstack Community to create Encrypted Token Portfolio apps on Blockstack to offer the ultimate privacy and control when tracking token holdings. Now the alpha releases of these Blockstack apps are available for the first time. 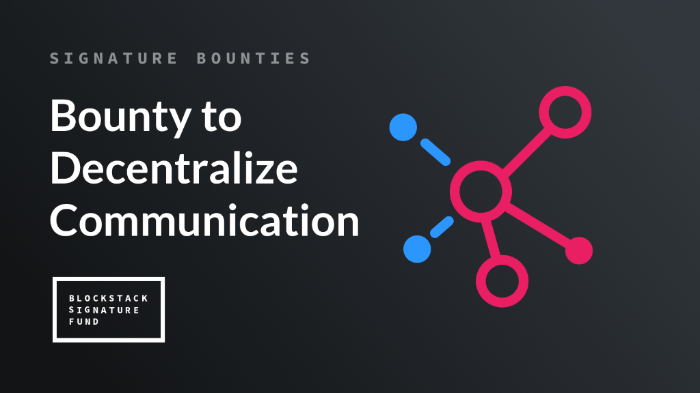 We are thrilled to announce our Bounty to Decentralize Communication consisting of $50,000 in prizes to further decentralize and secure communication for individuals and teams around the world. This bounty will have two tracks. One track will focus on creating a Community Messaging Application to provide open source decentralized projects, such as Blockstack, an appropriately secure communication platform for any open source community. The other track will focus on creating an Encrypted & Decentralized P2P Messaging Application that offers complete end to end privacy.